Rent and home costs are skyrocketing across the Portland Metro area and across the state. Hard working families are struggling to make ends meet. 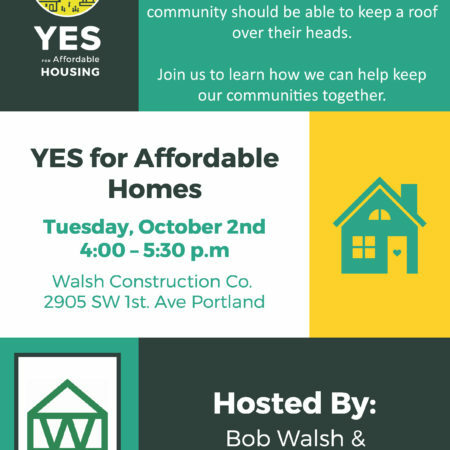 Please join us and Yes for Affordable Housing on Tuesday, October 2nd from 4:00 pm – 5:30 pm to learn how we can keep our communities together. 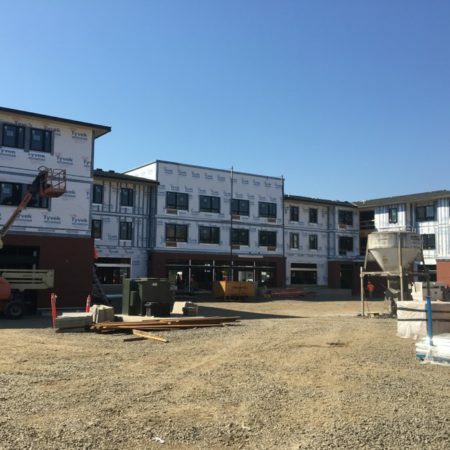 First Phase of Wesley Home’s Des Moines Senior Living Campus is Complete! The first phase of Wesley’s Des Moines campus redevelopment is complete and we’re on our way to the next stage of development! WALSH broke ground in October 2016 and the team achieved TCO Friday 8-31-18 on our final cottage building – one work day ahead of schedule! The project included phased replacement of existing cottage buildings with nine new cottages (32 units) and a 24-unit brownstone. Before and after aerial photos by Aequalis are attached to give an idea of the tran…sformation taking place on this beautiful campus. Phase 2 includes a new three-story Town Center with two residential wings and 151 units in 310,000 sf. After notice to proceed on 8-23, our site team is rolling right into this exciting new phase. Thank you to all our Wesley Homes partners, InSite Architects, and the following WALSH/RDF folks who had a part in making this project a success: Anthony Mizin, Mike Jensen, Jeremiah Phillips, Brian Lillybridge, Tom Koviak, Justin Nieto, Ryan Mertes, Sharon Libby, Cindie Banta, Claudia Coogan, Aaron Bishop, Marc Streleski, Mike Bang and the RDF Concrete + WRB/Window field crews. Thanks to William Wright Photography for the lovely finished photos. Cornelius Place will house the Cornelius Public Library including a YMCA center and 45 affordable apartments for seniors. Beautiful work out at the Cornelius Place project! 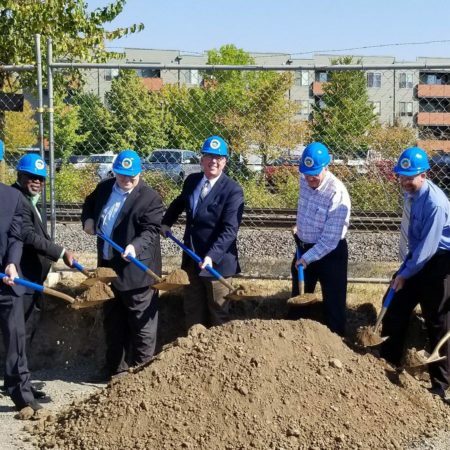 This multi-use development will house the expanded Cornelius Public Library including much-needed community space, a YMCA center, and 45 affordable apartments for adults age 55 and older. 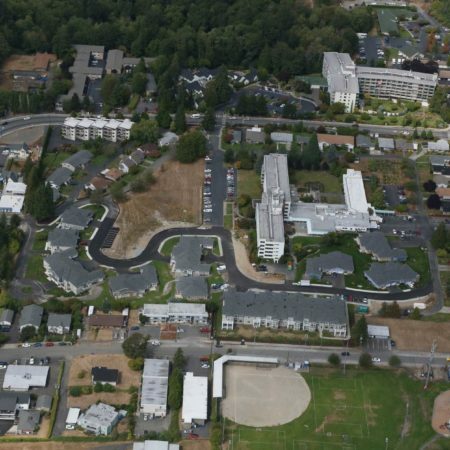 Cornelius Place is a joint project for the City of Cornelius, Oregon-Local Government, Bienestar and BRIDGE Housing. The new library will also provide a variety of services to support children, families, and seniors, including pre-reading a…nd early education programs, student success programs, and adult education. Huge thanks to Scott | Edwards Architecture, our RDF team and the WALSH team of Dean Lindstrom, Bennett Barnwell, Hunter Rains, Nolan Knox and Jill Mathews for their dedication on this community-building project! Congratulations to the Housing Authority of Washington County, together with DGB Properties, on their groundbreaking for Willow Creek Crossing Apartments today! The 120-unit project, designed by TVA Architects, will provide affordable, multi-family housing to serve Washington County families in need. The WALSH team of Dean Lindstrom, Brandi Pine, Erik Holte and Jill Mathews are excited to get going on this community-building project! An early move-in date at Lake City Family Housing has families ready to start the school year in their new homes! An early move-in date at Lake City Family Housing has families ready to start the school year in their new homes! Congratulations to Low Income Housing Institute and our Walsh/RDF team who achieved this goal on Friday, (30+) days ahead of schedule! The project has 70 affordable units and a preschool located on the main floor including an outdoor play area complete with a play structure. As always it was a pleasure working with LIHI and Runberg Architecture – we formed a great team that resulted in a smooth and enjoyable process. Many thanks to our crews and the hard work of the following individuals – Jeremy Winter (Earthwork), Tom Koviak (WRB), Jeromy Wood (Steel), Shannon Morey (Finish Carpentry), Justin Nieto (Concrete), Labor Foreman Vinny Ada; and Superintendent Nathan Connaway, Assistant Superintendent BJ Graham, Project Engineer Tanner Romo, Project Administrator Wendy Kato, Senior Project Manager Jack Kuester, QA Manager Brian Lenz, PM Greg Linnell, and many others who deserve the credit for a job well done! Wishing you a safe, fun and relaxing Labor Day Weekend! Thanks to the Team at our Blackburn Building integrated health and housing project! Great group of WALSH and RDF folks at our Blackburn Building integrated health and housing project for Central City Concern! 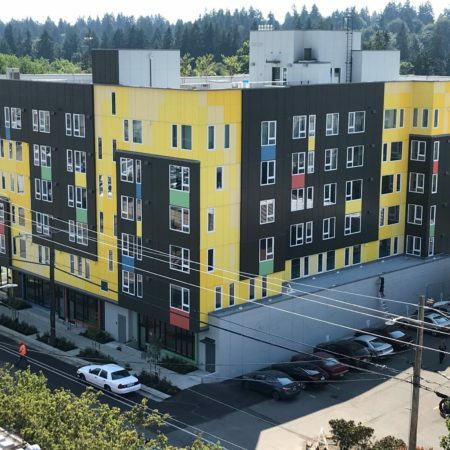 The project, designed by Ankrom Moisan Architects, Inc., originally known as the Eastside Health Center, is part of the “Housing is Health” initiative. The initiative is a partnership between CCC and six local hospitals and health organizations to provide supportive, affordable housing. The Blackburn Building, named after former CCC President Ed Blackburn, will include affordable housing, health care facilities, a pharmacy and commercial retail space. 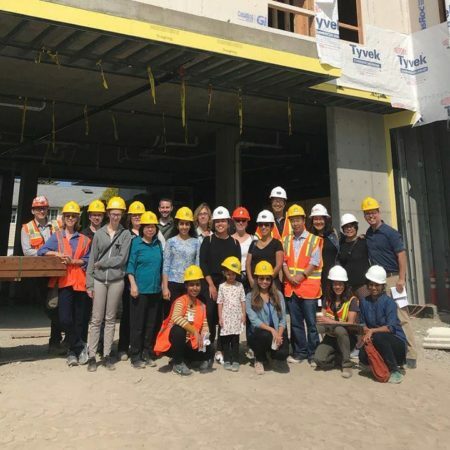 The 6-story integrated housing and clinical services building will focus on recovery and mental health services, with some targeted primary care services. The clinic will serve about 3,000 patients annually. 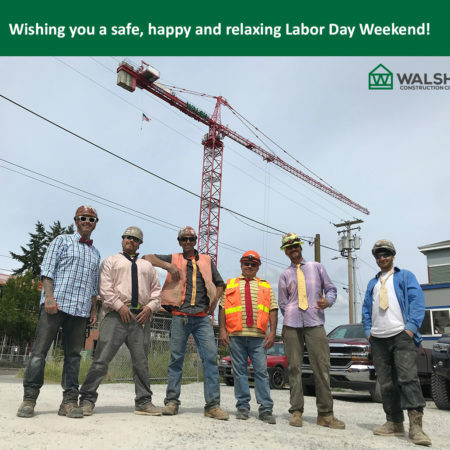 Thanks to the WALSH Team of Aaron Elliott, Matt Godt, Duane Stearns, Brian Ames, Steffen Schulz and Linda Woolery for their dedicated efforts building safely on a tight site near the MAX line! WALSH has enjoyed volunteering with SMART – Start Making A Reader Today since 2004! This dedicated organization needs to recruit 1,550 new volunteers by November 1 in order to read with 11,300 Oregon students this year. SMART Readers spend an hour each week during the school year reading one-on-one with PreK through third-grade children. Thank you for your help in bringing the gift of books and reading to Oregon kids! Tour of Orchards at 82nd construction site! OWCB welcomed electeds, funders, and other stakeholders for a tour of the Orchards of 82nd construction site! O’Neill/WALSH Community Builders, LLC (OWCB) created in August 2011, is a formal partnership between O’Neill Construction Group, a registered MWESB firm, and Walsh Construction Co. Thanks to Ali O’Neill and Maurice Rahming of O’Neill and to the WALSH Team of Ed Sloop, Kent Usher, Ben Bechdolt and Linda Woolery for managing an exceptional site on a busy… intersection! Designed by SERA Architects, Orchards of 82nd is being built for ROSE Community Development and Asian Pacific American Network of Oregon – APANO to combine transit-oriented affordable housing with a multi-cultural community center in a walkable and accessible location for housing and community residents. 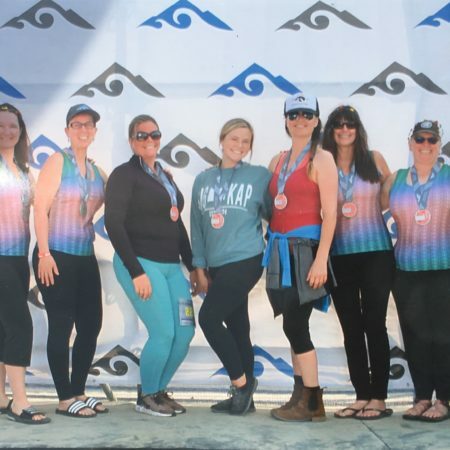 130 mile relay in 33 hours for Portland to Coast! 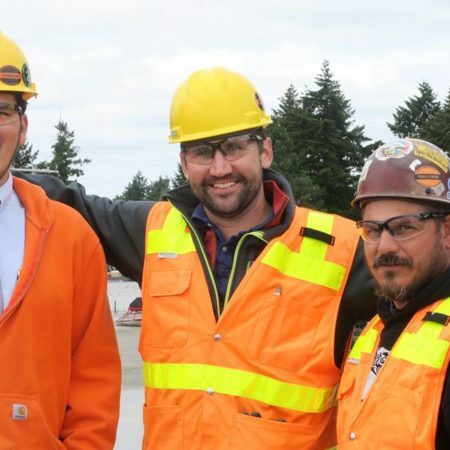 Way to go Team Walsh Construction!